We are given a graph with $n$ vertices, $m$ edges, and path edge costs of $x$. For vertices without a direct path that are distant exactly one neighbor, we can add new edge with edge cost $y$. Our task is to find shortest path (i.e minimum cost) between the start vertex and all others vertices. 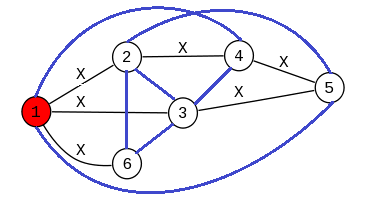 Browse other questions tagged algorithms graph-theory graphs or ask your own question.